Can Blockchain Technology be the solution to Mindfulness everywhere? Rob Fajardo, Thought Leader featured in Inc., Forbes, and Everipedia. Founder of Leave Normal Behind and Host of LNB Tv. These days we all live crazy, hectic lives. Sure, it’s not as bad as our ancient ancestors being chased by wild animals, but it can sure feel that way sometimes. Between our crazy work schedules and all our electronic devices, our brains are switched on all the time. It’s getting harder to shut it down. As the founder of Leave Normal Behind, it is my mission to inspire others to become the best version of themselves and create things that matter. We cannot become the best version of ourselves if we are never able to cultivate an inner environment of peace and tranquility. We need this in order to focus, come up with new ideas, and manage our emotions at a high-level. When we get lost in the weeds, our focus dwindles, and we become more stressed, frustrated, and nervous. Our decision-making goes out the window and we start operating without a clear mind. Did you know a recent study found that 8 hours of sleep is no longer sufficient? Because of our hectic lifestyles experts are now recommending 8.5 hours of sleep to get the same effects. We are bombarded by thousands of images each day as advertisers battle for the domain of our mental space. This infographic below shares where we spent most of our time. With all of this going on, slowing down can sometimes seem impossible. At times it feels like we’re on a hamster wheel and we tell ourselves that “we just have to keep going a little while longer until it stops”. Unfortunately, this is a surefire recipe for disaster. All that stress builds up after awhile this stress can boil over into a major disaster if you let it. So how do you avoid letting your stress boil over in today’s age of nonstop brain activity? The answer is mindfulness and meditation. If you’re here reading Thrive Global, then you are most likely aware of mindfulness and meditation and their amazing hollistic benefits. You may also be aware that interests in mindfullness and mediation have skyrocketed as of late. Mindfulness exercises can help you quiet your racing mind by learning to focus on what is important and tuning the rest out. It can help you decompress from your stressful day by telling your brain when to shut off. Mindfulness often takes the form of meditation or yoga practices, where visualization and breathing exercises are central to the feeling of relaxation you get in the process. Training yourself to be more mindful isn’t always an easy task. Unconditioning all those years of negative programming requires mental fortitude and an intense desire for growth. It can feel like there’s no time or that you just can’t keep up with the practice. Sometimes you might even feel guilty for taking time for yourself because you believe that you should be doing something else that is either making you money or providing an immediate benefit to you in some other way. But it’s important to remember you can’t pour from an empty cup. This is where the blockchain technology comes in! Mindfulness on the blockchain is genius idea that if implemented correctly may be a solution to distraction and inner turmoil world-wide. We are programmed to seek reward for our actions, and if we don’t get an immediate and obvious reward sometimes we move on to a different activity. Even if we know that what we are doing will be beneficial in the long term, without short term immediate results we tend not stick with it. It’s the same with the gym. We all buy a membership and then don’t go as often as we would like to even though we know that the long term benefits of the gym are in our favor. Imagine if there was an additional incentive when you went to the gym or meditated. 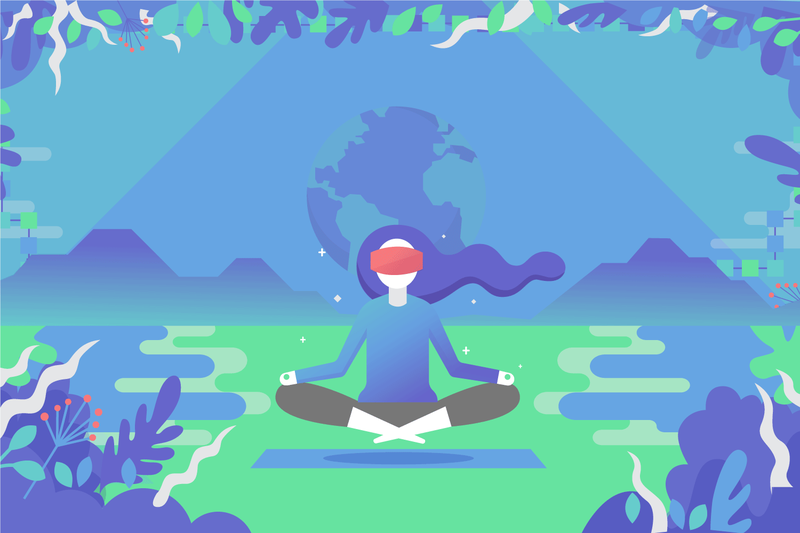 With mindfulness on the blockchain, you can actually get rewards for practicing your meditation, in the form of leaderboards or even cryptocurrency for participation. Through the blockchain you can be rewarded for your attention, instead of being bombarded and attacked for it. This infographic shows some info on how blockchain technology could literally PAY you to MEDITATE! How would the world change if people were paid to take time to meditate and spend time with themselves ? Would we be less rushed ? Would there by more compassion ? How much happier would people be if meditating was rewarded with cryptocurrency and they could then use this currency to fund their life? We choose not to take time for ourselves because we do not think its “worth it” for us to do so. Little do we know, that if we mediated more often and maintained a positive state of mind then we would experience higher level of success in all areas of our life at a faster rate than if we do not meditate and practice mindfulness. It might seem like meditating slows you down, but it fact it speeds you up because you will think more clearly and make better decisions to achieve your goals faster than you would if you were distracted, frustrated, and stressed. The technology has guided meditation and meditation music built in so you don’t have to go searching for yoga poses online or looking for music to listen to as you meditate. Using blockchain technology to incentivize and reward Mindfulness produces a twofold effect. Firstly, in the long term your mindfulness will pay off with better mental and physical health. Secondly, in the short term your mindfulness will give you an immediate pay off in actual cryptocurrency and the “gold star” effect of seeing your name on the leaderboard in competition with others. If you’d like to learn more about mindfulness on the blockchain then follow this link and read this infographic. Meditation can be your tool to up-level your mind and solve current problem that you are dealing with. Trust the mindfulness and meditation process, it is not an overnight thing. You have to practice and apply yourself if you want the spiritual and physical benefits. The ultimate key is to be able to sit with yourself and have a conversation with yourself in silence and relaxation. If you can do this, you will open yourself into a new world. You will be amazed at the ideas and thoughts that flood your mind once you set yourself up in a place of inner peace, tranquility, and focus. Leave Normal Behind, become the best version of yourself, and create things that matter ! Rob is a sought-after speaker, thought leader, and business accelerator. He is the founder of Leave Normal Behind - a community, content, and events hub for purpose driven people. The mission of LNB is to inspire others to become the best version of themselves and create things that matter. He is also one of the viral marketing partners behind fidget spinners.